Hang onto your swim trunks folks, we have a super easy but completely refreshing summer treat recipe for you on this hot, hot summer day. It only takes THREE simple ingredients. Sugar, Nature’s Nectar 100% Berry Berry Juice, and a lime. You can add red or purple food coloring to make it prettier but really when you see the end result, I don’t think you really need it. This is a budget friendly recipe that is lots less than even one shaved ice or snow cone would cost you. Around just $1.28 to create this recipe! Did you know that ALDI own brand Nature’s Nectar 100% Juice Berry Berry recently won a SELF magazine Healthy Food Award under the drink category? Berry Burst is made from four fruit juices and has no added sugar. Not only is it delicious, it is healthy too! When you add the sugar for this yummy treat, you don’t have to feel guilty as it is the only sugar added! First you will zest your lime! I’m a zesting newbie so I wasn’t quite sure to work this but I found a cheese grate and did some zesting of the lime. I usually skip this step on recipes because I didn’t understand how the zest worked. The zest of a lime can add some significant flavoring so I’m not going to skip this step in the future. Set the zest aside. 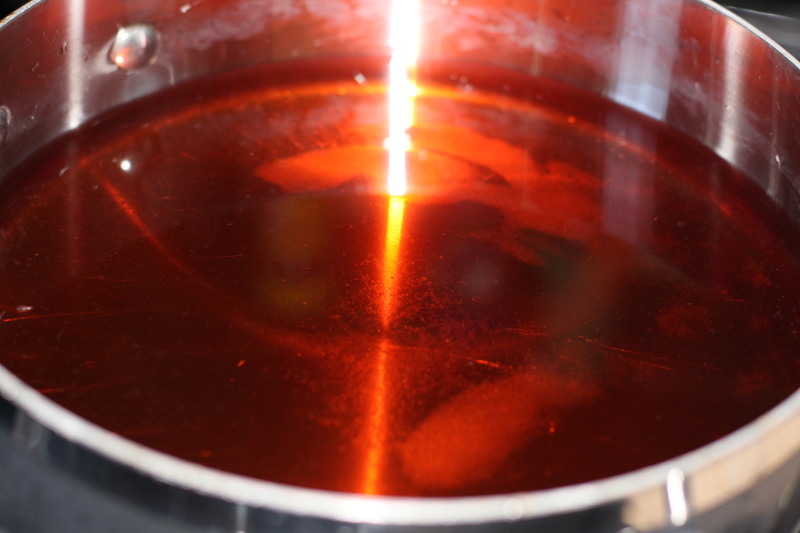 Boil the juice and the sugar in a medium sauce pan. Mix the sugar into the juice while you are boiling so it is well set. Remove from heat and allow to cool. Since I’m impatient, I didn’t wait for it to cool completely like the recipe suggested but it didn’t seem to affect the recipe, though it may have taken it longer to freeze. 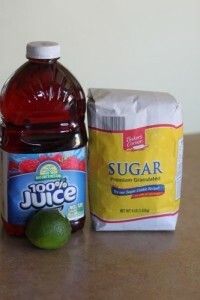 Add the zest to the mixture in the juice mixture. Pour into a glass baking dish. Cover with clear wrap and put in freezer. Check on it every 30 minutes. Or every 15 minutes as my kids were bugging me about checking it. When it starts to freeze, take a fork and fluff. Freeze for additional 30 minutes minutes. Fluff again. Then go to bed and forget about it. Fluff again in the morning. It should resemble a snow cone or shaved ice treat. Delicious fluffy icy treat. I’m guessing if you want to make this an adult treat, you could add a little rum or vodka to this. I’m not sure how the measurements would work out but I’m guessing it would be very tasty. I have another icy treat recipe to share with you on Friday and then come back on Sunday for a ALDI gift certificate giveaway! 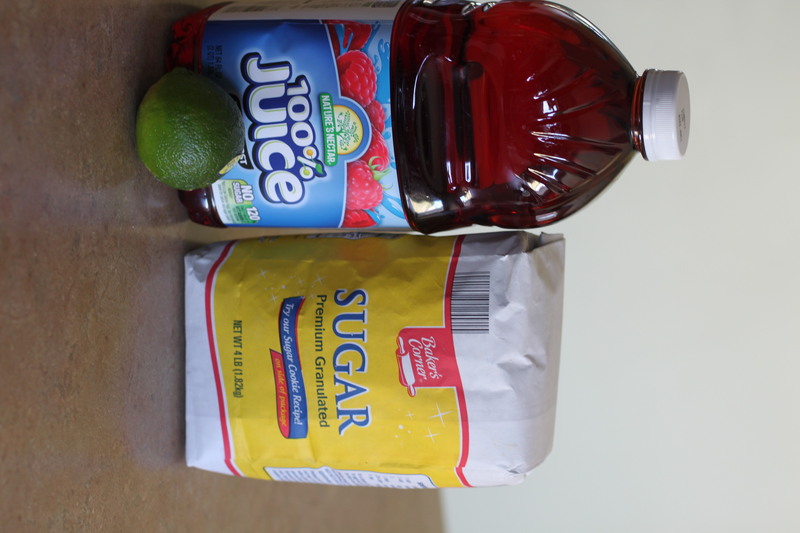 Squeeze juice from lime in a medium saucepan and combine with sugar and juice. Pour mixture into square glass baking dish. Cover with plastic wrap and place in freezer. After 90 minutes, use fork to stir and scrape mixture. This may be longer time period depending on your freezer settings. Repeat every 30 minutes until mixture resembles shaved ice. 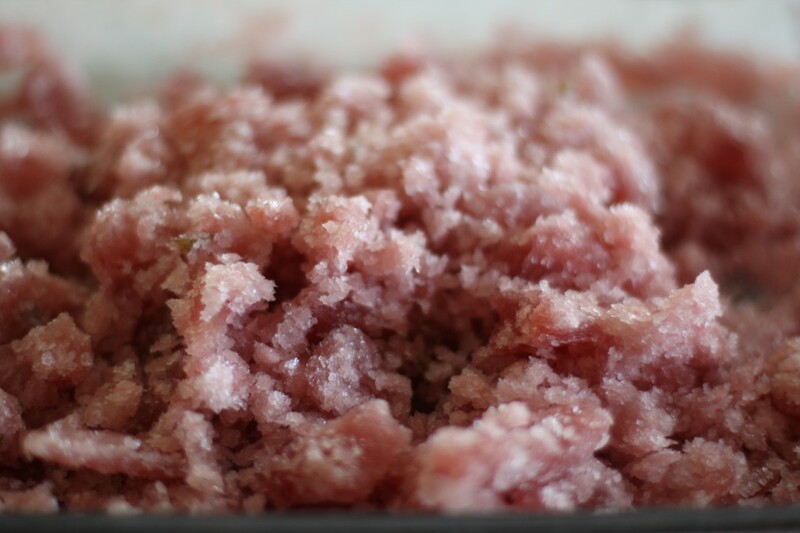 Remove from freezer 10 minutes prior to serving and fluff with fork. 17.4 grams of sugar per serving.